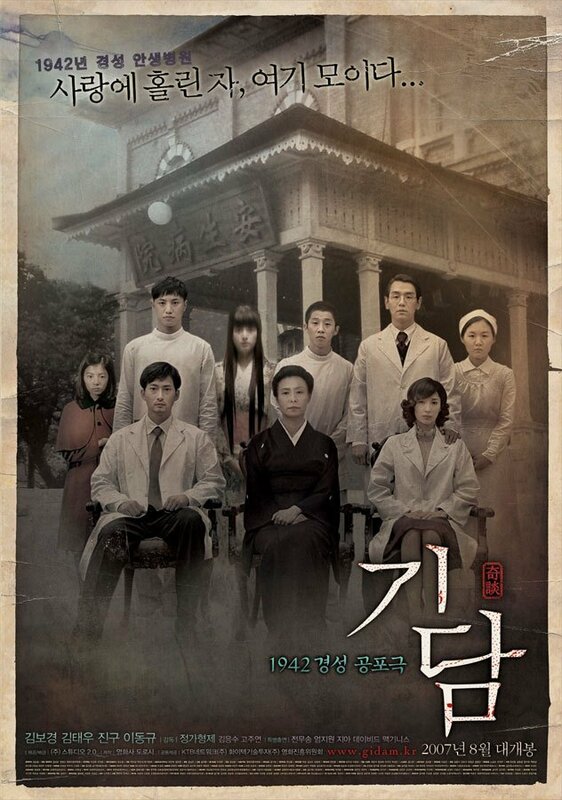 In 1979, aging professor Park Jeong-nam is made aware that Ansaeng Hospital, the institution in which he began to forge his career, is due to be demolished. At home, the professor opens an old photo album featuring pictures from his days as an intern there, and begins to reminisce about an awful four day period that occurred in 1942, back when Korea was under Japanese colonial rule. He recalls how as a young man (Jin Goo (진구) he developed an attraction with the corpse of a beautiful young girl; how a car crash survivor named Asako (Ko Joo-yeon (고주연) was haunted by the ghosts of the tragic event; and of brilliant neurosurgeon Dr. Kim Dong-won (Kim Tae-woo (김태우) and the troubled relationship with his wife Dr. Kim In-yeong (Kim Bo-kyeong (김보경). Epitaph is an attractive and unsettling horror film, one which is in actuality an omnibus of short supernatural stories loosely tied together so as to masquerade as a feature. This particular narrative structure is one that directors Jeong Beom-sik (정범식) and Jeong Sik (정식) – more commonly known as the Jeong Brothers – returned to in both Horror Stories and its sequel, yet Epitaph manages to marry the disparate events more successfully than their later attempts. The narrative within Epitaph features three short horror tales set within the confines of the Ansaeng (safe life) Hospital, bookended by scenes of the now-elderly Jeong-nam as he recollects events from his past. As the film jumps between stories and across timelines, the narrative, though entertaining, ultimately becomes a convoluted mess that is often frustrating to endure, and is in desperate need of a re-edit. Yet that said, the three episodes themselves are competently portrayed and engaging. Initially Epitaph focuses on young Jeong-nam as an intern struggling with the gory specifics involved in conducting autopsies, whose attention is captivated by the beauty of a young corpse. The potential of the premise isn’t capitalised upon however as any sense of growing obsession is curiously absent, and as such is primarily used to help set the stage for the other two shorts. The notable highlight of the film comes in the form of the second story involving traffic accident survivor Asako. Attempts are made to combine both a psychological drama with traditional scares and the tale somewhat succeeds. Lastly, a doctor becomes suspicious of his wife as a vicious serial killer is on the loose. In each case, the directors simply capture the events that transpire without managing to generate the required tension and suspense, resulting in a horror film that, aside from a few unsettling moments, is crucially lacking in scares. Epitaph is additionally guilty of not only employing a wide range of cliches, but also rather blatant replications from superior horrors that often border on plagiarism. It’s a shame the Jeong Brothers have opted for such an approach as the set-up, and particularly the time period, lends itself well to the creation of a uniquely Korean horror film. Yet through the incorporation of techniques found better elsewhere, Epitaph never moves beyond being simply entertaining and into the realm of genuinely frightening. Ultimately the real power of the film lies onscreen within the compositions and shots, which are consistently impressive throughout. At the 2007 Blue Dragon Awards, such prowess was recognised as Yun Nam-ju was presented with the Best Cinematography award, while Best Art Direction went to Kim Yu-jeong and Lee Min-bok. Each location is wonderfully constructed to convey the 1942 era credibly, with the aesthetics of each tale generating a unique, yet interconnected, atmosphere. The hospital interiors including the hallways and the mortuary are of particularly of note in the first tale, which bridge seamlessly into the second and third stories as youngster Asako receives treatment while the married doctors conduct their work. Furthermore, Asako’s nightmares allow the artistic direction to move into more surrealist territory as well as incorporate some wonderfully composed exterior shots, which links well to the otherworldly Japanese-esque arenas in the final story. In each instance the designers manage to simultaneously articulate the mood and sensibilities of each tale while linking it within the context of the whole, making Epitaph quite the visual treat. Epitaph is a competent and visually attractive horror film by directors Jeong Beom-sik and Jeong Sik, better known as the Jeong brothers. The omnibus film features three tales that are generally unsettling rather than frightening, largely due to the haphazard narrative structure and employment of cliched tropes from superior examples of the genre. Epitaph is a solid, though unremarkable, addition to the K-horror canon.